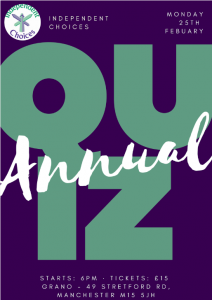 We are pleased to invite you to our Annual Quiz and Fundraiser event. The new venue will be at Grano 49 Stretford Rd, Manchester M15 5JH and there will be a hot and cold buffet (vegan and Vegetarian options available). There will also be a raffle with a wide range of exciting prizes and Henna tattooing. Come along and support our vital services and join us in having fun on the night. See link below to get your tickets.